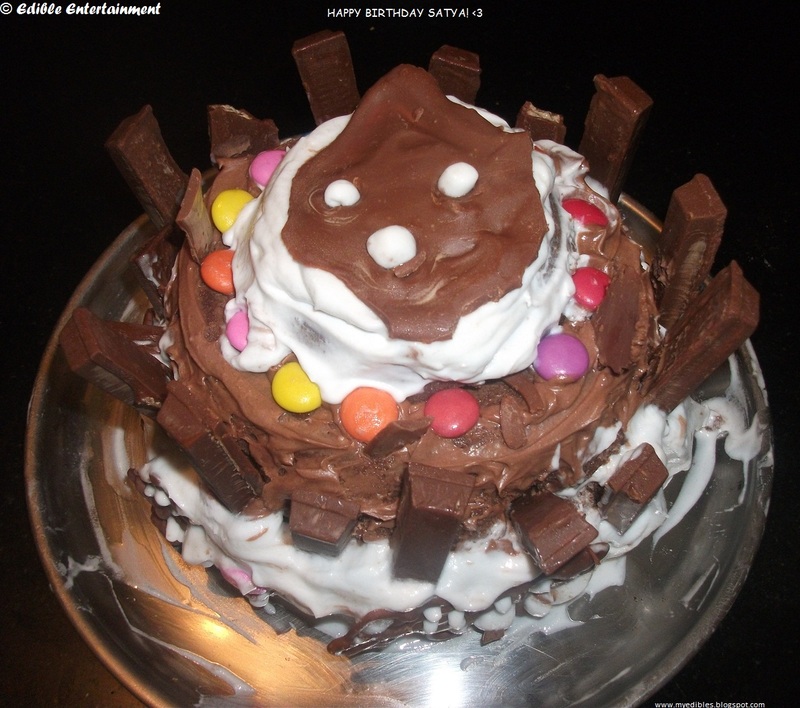 I cannot believe that Edible Entertainment is 100 posts old already! When I started this blog on a Saturday night, I did not for one second know that this would turn into a passion! I read Divya Kudua’s blog Easycooking & just made a decision on an impulse to start a Food Blog. Then, Manali Shah’s valuable opinion made me realize how important it is to have a good click of your dish. Along with cooking, my dormant interest in photography has emerged too. And now, I try my best to make my food on the plate look good, get a best shot of it from the best possible angle, editing it and so on…. 1. Take the largest of the cake & apply Whipped Cream all over. 2. Sprinkle some chocolate sprinkles, scrolls, etc. 3. Place the second tier cake on it & apply chocolate buttercream or ganache. 4. Place the 3rd layer of the cake on top & apply whipped cream on it. 5. Stick Kit Kat Finger on the side of the cake to make it look like a fence. If this is not possible, just poke each Kit Kat gently on the lower cake layer. 6. Decorate the second layer with Gems or M&M. 7. Use any Chocolate Decoration of you choice on the third. I melted some chocolate & make a supposedly joker face. 8. Keep it chilled until you have to cut it. * Make sure your whipped cream is chilled. Mine started melting very soon. I had to freeze it every 20 minutes while decorating. Yes, I know the cake looks comical. And that was the intention - really. You could of course do it neatly. Congrats. The cake has come out well. Congrats Kavi and a belated happy birthday to your brother as well. Hope you made his day with this wonderful cake. aww. that's really cute! and yes, your bro does have a large head! :D must be really brainy! Ooo Satya is 15 already?! Awesome Cake! woaah! Satya is becoming big! Happy birthday! cake has come out fantastically! congratulations! 100 posts! A great milestone indeed. Looking forward to a lot more from you! Your patience & persistence will surely get your blog a long way!